Yetiforce helps companies best utilize free professional opensource CRM to lower costs and improve performance throughout the entire communication structure. I like the posibility to customize it without coding knowledge. It is very stable until now when we have over 100.000 entries in the database. We use it as main program to track/keep records in our company for like a year, and i am really pleased about it. We switched from vTiger that is very robust and very limited. Started as a very good open source but, unfortunately now, is all about money. There`s not much that i don`t like. Maybe the chat function can be improved and reporting. If you like an open source CRM/ERM system, that its versatile, easy to customize, YetiForce is the one. We manage our logistic and transport company that has about 150 employees. Thank you so much for reviewing our system. The good news is that 4.5 will bring a completely new chat. "One of the best CRM Systems I have used, Free or otherwise"
Very intuitive and responsive UI, Easy to read and locate what you are looking for but updated and modern. Great features you need in a CRM such as email sync, automation, inventory, sales, marketing, dashboards and more. All at no extra cost and coming with a fully open sourced system. The dashboards are also very appealing visually but also provide a lot of information quickly and reliably. The documentation is somewhat lacking, I didn't post on the board for support but it seems that even with free support, the response time is acceptable. Other packages for support are available as well as custom integration, development and implementation.Installing on your own server is somewhat difficult, for me. I used the documentation but ran into problems due to either a lack in the Yetiforce documentation or a lack in a required module documentation. Try out the demo first to see if it meets your needs. Set-up is somewhat difficult to manage unless you have an IT team or experience with servers. I would personally advise to use something else if you are a small-med team with no IT department. Thank you for expressing your opinion about YetiForceCRM. It is so easy to work with. We needed a heavily customised CRM and had tried others in the past but none gave us the flexibility to create the type of system we wanted. Yetiforce allows us to create our own modules very quickly. They have done incredibly well in such a short time to create such a robust and secure system. They produce regular updates with new features (an incredible list that allows you to do so much more!). With past CRMs we could be waiting a year before a new release and they were always very buggy. I also love the team at Yetiforce - they are so helpful and supportive. They have gone from strength to strength and I am excited to see where they go with it from here. Would definitely recommend Yetiforce. There is lots of information on github (and their website) to get you started. Github also has a growing community of active supporters who can help you. Thank you for taking the time to make such a comprehensive review. It means a lot to us. Lo que mas me gusta es que es un crm con un montón de características, que en otros crm son de pago, sin ninguna duda lo que mas me gusta es la comunidad y e equipo de Yetiforce, qu de manera desinteresada nos ayudan con cualquier problema que te pueda surgir. En realidad no me disgusta nada, si algo tuviera que pedir seria una comunidad en Español, pero bueno de momento el translator se defiende bien,jajajaja. Gracias por agregar tu opinión! "Wonderful CRM and Cost Effective!" This CRM is excellent. Very customizable. There takes some trial and error, but the list of options you have are staggering. Also, it is free (If you host it on your own server), so that makes it even more appealing. There are no manuals, so it will take some time to figure out how to maneuver around the program. It is a great system . We were looking for something that would help us keep track of all of our accounts that was also cost effective. YetiForce helped us organize all our accounts as well as became our new ticketing system! Thank you for your comments and taking the time to review our system. "Great choice for any business.Easy to use." All necessary modules, widgets and features are already in the system for free, the developers also provide free help. The system is quite easy to manage and it’s very user friendly when properly configured. One of the factors that made us choose YetiForce is their beneficial license. The app is fast, secure, looks good and works well. YetiForce has lot's of functionalities which help users with their everyday tasks. Contact & Account Information about our clients. Clients support. Manage Task / Activity employees. The software meets our specific requirements, but also offers great deal of flexiblility, security and reliability. Some functionalities deserve a bit of fine tunning in order to make the image complete, but all in all benefits significantly outweigh the cons. I can honesty recommend YetiForce as a great CRM not only for companies but also for different organizations and offices. We are using Yetiforce as a system for projects and investments monitoring in the Ministry of Entrepreneurship and Technology. We have been working with Open Source CRM programs since 2005. We have tested most of them. Now spent time with YetiForce since its first version and so far found no reasons why chance to one other. It has many unique features and functions, great layout, safe and it’s easy to administer. It’s a real multibranch software. There is no roadmap for future evolutions and functions. E.g. in version upgrades some functions has been removed without just any notice and that has caused problems. Just try it, there is a big possibility you be fond of it. Thank you for the review. We feel honored that you recommend us as you have years of experience in the CRM industry. "Best CRM you can get - easy to use for non-computer geek"
Once you understand the application structure - all the dependencies - you can adjust the appplication to your business processes hassle-free. The available documentation is not sufficient to get all the answers. Requires lot of tries to understand and get the results you aim for. Lack of mobile version for iPhone. Ease of use, for free and intuitive. I store all the leads I gather, all the contractors and partners in there and once any lead turns into project I can easily manage all necessary resources to run the project. "Reliable and fast CRM. Perfect choice for any business! " I highly recommended YetiForce, because of features and customization they provide. CRM is very user friendly, simply to use and intuitive. They can implement custom module for you! Everything is customizable and you can add fields and particular views. YetiForce shows how good CRM can be. Can't find any specific disadvantage at this point. CRM works well! If you want CRM solution, I think you should at least give a try to YetiForce solution. It is Open Source, so you can lower all the cost. Also, good customer support and contact. Thank you very much for the nice recommendation. We are glad you like YetiForce. "Until today the best crm that I used"
Easy management of customers and sales teams. In my opinion the ability to report could improve. Thank you for the feedback, we appreciate your suggestions regarding the improvements. "Complete and easy control "
Unique design, transparent and easy to customize. Each window has as so much data as the brain can handle and you do not feel that you have lost control. It does not matter whether you have a large company or a small business and you solved only one problem in business you won. But believe them to be solved a lot. Thank you for taking the time to review our software. We appreciate it. We are an Italian system integrator and we are using YetiForce for all our CRM projects. We can manage all the CRM processes like Marketing, Sales and Post Sales with a very reliable system and with an excellent performance. We asked a feedback to our customers and they came back saying Yetiforce application is intuitive, fast and user friendly. "Great CRM easy to use "
Frankly there is not much to dislike. Perhaps the left nav bar need to be more flexible when used with small screens. Thank you for taking the time to review YetiForce CRM. We are glad that you like the product and are satisfied with our customer support. Nothing, the all functions are great, if Some func arent needed - switch it off. Flexibility, full of features you have to pay for other competitors. Lack of documentation, even in English language. Implemeting YetiForce in my own small company. For free as it is, at this moments, the benefits are a lot. Thank you for taking the time to review our software. We are aware of the fact that we still lack the documentation but we do our best to support users at GitHub. On a daily basis I apply YetiForce in a work environment. This program helps to solve almost any issue I have. Thank you very much for your comments and positive feedback. "great and free CRM - YetiForce"
you have to try it. It is worth it. Thank you for your positive feedback. If there are too many options for you, you can disable them in the admin panel and keep only the ones you use. * We monitor all YetiForce CRM reviews to prevent fraudulent reviews and keep review quality high. We do not post reviews by company employees or direct competitors. Validated reviews require the user to submit a screenshot of the product containing their user ID, in order to verify a user is an actual user of the product. Company: YetiForce Sp. z o.o. Hi there! 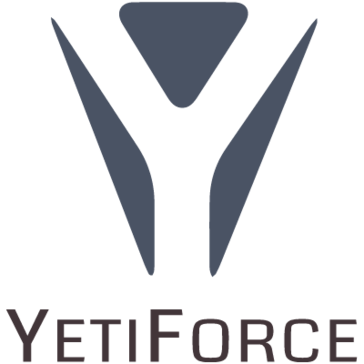 Are you looking to implement a solution like YetiForce CRM?